Despite the misty gloomy weather we headed back to our black bear research blind along the tracks o the Toonerville Trolley. As we got closer to the blind...out popped Junior. He is the male sibling of Momma Blaze's yearling triplets. He stood up to see who was coming. He then ran into the woods while we unloaded the speeder and go up in the blind. It wasn't long and he came out to see the speeder had brought him. Well...as usually Little Diva got surrounded by sandhill cranes in the fog. But...she is getting smarter...she ran and scattered them back into the swamp. It's very cool to see these young bears becoming more independent...learning how to deal with situations that momma used to take care of. Still it's hard to see them out on their own. Life...I guess we all have to face it sooner or later. Eventually Little Diva made it down to the blind. She came cautiously out of the woods....knowing her siblings were probably somewhere nearby. Bears don't like to come out in the rain usually. It hinders their hearing and smelling abilities that they count on for survival. Now for our Sunday along the tracks of the Toonerville Trolley. Overcast day…looking stormy. We found Little Diva down further on the tracks. Before long two then four sandhill cranes came out to join her. She didn't seem too happy...remembering the time that eight of them started cackling at her. We were very excited to find a fisher running along the tracks of the Toonerville Trolley on Sunday. The fisher is related to the weasel and pine marten families. It is rare to see them. Once it caught a hint of us being there it quickly disappeared. Eventually Little Diva came down to visit us at our research blind. We saw Junior in the distance to the south but he didn't come down. We found out why later. So...here is the reason that Junior decided not to come down to see us. Bella was waddling her way down to see us. We are still hopeful that she has a cub hidden somewhere...and therefore very intolerant of the yearlings. Little Diva saw her and immediately went up a tree. She's been through this routine a time or two...poor dearAfter Bella left...out popped Little Diva. She then proceeded to get a drink of rain water out of her favorite drinking vessel...the tarp. She also likes to crawl around on the apparatus that is hidden under the tarp...a 'bicycle' speeder that goes on the tracks...powered by a man with muscled legs. The rain started so we called it a day. We have been so lucky to see at least one or two of our bears every time we have come. After an amazing morning at Seney National Wildlife Refuge...we headed back to our black bear research blind...along the tracks of the Toonerville Trolley. We were greeted by Momma Bella...who we are almost certain as a little cubbie tucked away. We were so happy to see Momma Blaze's triplet yearlings. They are definitely staying in the area...and very happy and healthy. My favorite...Little Red. She is such a cutie...even in this gangly stage of growth. She was the first one that held us 'captive'. She was just enjoying herself wandering all around. Momma Bella chased her up a tree at one point. But she came back down and continued to enjoy the day. One of the other yearlings...Little Diva...had a rougher day. She came down when Momma Bella was out and about. Well, Bella immediately chased into the woods and up a tree....more than once…although she did manage to sneak a couple of treats. I thought she looked quite comical. She looked kind of like an ape sitting in the tree…saying...'I'm not very happy right now'. We actually made two runs back to our black bear research blind today. The second run was to replace the dead batteries in our trail cam. Unfortunately they died right after our last visit...so we didn't get to see who has been back visiting us. So when we went back we were treated to the third yearling, Junior, up close and personal. He...like his sister, Little Red...was enjoying just wandering around....holding us 'captive'. Well, it wasn't a bad captive...they are very 'captivating' creatures...and we are so privileged to get to catch even a glimpse into their lives along the tracks of the Toonerville Trolley. The yearlings each came out and showed their individual personalities. What a privilege to spend this kind of up close and personal time with these gentle non aggressive creatures. Little Diva…I think of her as the middle child...not quite the oldest and boldest...and not the young spoiled child either. Both of her siblings seem to be able to push her around....poor dear. Little Red…she is the youngest and smallest...and my favorite. Even though she is small she has been spoiled enough to take what she thinks she deserves...even running her big brother around. She was checking out our speeder...just like any inquisitive child. Junior…he is the oldest and only boy of the yearlings. He loves his treats and when he hears the train or speeder he tries to be out first. He spent quite a bit of time wandering around the area hoping to find something that the others may have missed. It made for some great photo ops for me. They stand up so they can see better. They have extremely poor eye sight...but great hearing and smelling. It was great fun…hoping to see the cubbie next time. We headed back to our black bear research blind along the tracks of the Toonerville Trolley around 11:30am. We had visits from Junior and Little Diva when we first arrived. It was fun to watch them. Little Diva was the aggressor this time. She chased Junior off...but he kept coming back anyways. Then we saw a large bear chase Little Diva. We first thought it was her momma...Blaze. But when it finally appeared and came down to us....we found it was our dear Bella. She was momma to the ABCs back in 2012. But we have only seen her briefly in the last few years. Maybe she has finally returned with a cubbie or two along the tracks of the Toonerville Trolley. We believe she is an older daughter of Blaze. Blaze has a black snout...unlike most of the bears. And Bella has the black snout...and a black nose...which helps distinguish her from Blaze...along the tracks of the Toonerville Trolley. We were so excited to find a very tiny sandhill cranes colt along the tracks of the Toonerville Trolley. Unfortunately its parents brought it out while we were heading down the track. The poor thing couldn't get off the tracks. We practically stopped to give it time to find a clear spot to move off the tracks. The parents of the little sandhill crane colt were in front of us trying to lure us away from the colt...which of course we were trying to do. The one parent was acting like it was injured to lure us away along the tracks of the Toonerville Trolley. We woke up to a rainy morning...so no early morning at the Refuge. So we headed back to the black bear research blind along the tracks of the Tahquamenon Falls Riverboat Tours & the Famous Toonerville Trolley. We weren't disappointed...Junior was down on the corn...and Momma Blaze popped out of the swamp. She made her way down to see us...working her way in and out of the woods till she got to the trail near us. She is one beautiful bear. She is definitely the Matriarch of the Toonerville...calling the shots. She made her way through the ferns coming right toward the blind. I think she was showing me her best side. We also had an unexpected visit from Little Red along the tracks. She actually came out when Momma Blaze was eating some treats. She popped out...grabbed a treat and headed back into the woods. Later...after Blaze had left...she surprised us by coming out from under a tree right across from the blind. She is so darned cute!!! We had a surprising visit and encounter with ten sandhill cranes. Little Red was not happy with them being so close to her. She came out from under the tree....went 'woof'. The sandhills all started cackling at her...so she ran across the tracks away from them. She eventually came back out on the other side of the blind away from the sandhills...and grabbed her treats. The sandhill cranes were quite entertaining. First we had a pair come down near us...being run out by the territorial pair. Then another pair joined up with the territorial pair and came down to make sure the first pair vacated the premises. Then four others arrived but stayed away from the action. I love seeing wildlife up close and personal...witnessing things not usually seen. Sunday we did go back to our black bear research blind along the tracks of the Tahquamenon Falls Riverboat Tours & the Famous Toonerville Trolley. With the intense heat and humidity we weren't sure if we would see them. The bears definitely do not like the heat...but luckily they were there to greet us. Two of the yearlings came out first then out popped Momma Blaze. Momma Blaze made her way down to see us...but the yearlings stayed away. Blaze gets first dibs at the fresh treats along the Toonerville Trolley...since she will be having cubs this winter....hopefully. While we were watching the yearlings...they would lay down to eat corn along the. But due to the heat they would wander out into the swamp...take a dip...then come back out. If you look closely you can see Junior...dripping wet after take a cool dip in his 'pool'. Despite the rain we decided to go back to the black bear research blind along the tracks of the Toonerville Trolley... at least to get the card from the trail cam. Well, we hadn't even got the speeder turned around when out popped one of the yearlings...then a second one. Yeah!! Black bears hate the rain...but love us. Junior was the first to come down…although I think he and Little Diva had a ‘discussion’ about who would come first. They stood on their hind legs and had a little punching match. Little Diva finally made her way down to see us. Brother, Junior, got first dibs then shared with his sister. She would grab a treat then run into the woods. Junior held his ground…then finally disappeared into the wood, too. Poor dears...Momma Blaze kicked them out a couple of weeks ago. Now they have to fend for themselves. Good to see them sticking around each other...at least for now. Well the rain continued so we decided to head out…till next weekend. 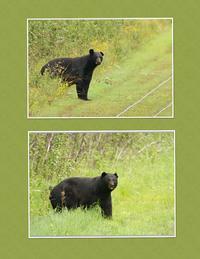 It was a picture perfect day…sun…breeze and few bugs…and we had five different black bears visit us!! The surprise was Momma Blaze with a new 'man'. I think we will call him Scarface...because he is. He is one tough looking dude. I guess she is two timing Dingle Beary. What an amazing experience...ok...I know...everything is amazing and awesome...but it truly was. When we had Scarface...then Momma Blaze step out along the tracks...we could barely contain ourselves...ok...I could barely contain myself. Michael told me to be quiet. FYI Scarface only came up so far...then caught a whiff of us or the speeder and kept his distance...but also kept an eye out for his woman. Anyways...the closer they came...the more excited I got. It's not often that the male and female black bears share quality time together....and for us to be part of it was truly a once in a lifetime. I have to say...this guy gave me the creeps though. I don't usually feel that way...but he was one scary looking dude. Now big old Dingle Beary is just too darn cute. This guy showed up briefly in 2012 after the Sleeper Lake fires. He had part of his left ear missing at that time. He was probably a third or fourth year at that time. He must have remembered Momma Blaze and came back when he was man enough to woo her. Junior, now a yearling who Momma Blaze kicked out to fend for himself...as she 'prepares' to have cubs next winter. Poor boy...he was having an issue with the territorial male sandhill crane. They were so comical to watch...each afraid of the other. His mate is on their nest in the marsh...he is always out patrolling...making sure no intruders bother the nest. It was comically to watch him stretch out and flap his wings...when our yearling black bear, Junior, was making his way down toward us. It was fun to watch them each weighing their 'opponent'...seeing who would be the first to give. Actually, Junior took a short cut through the woods...and came down in front of where the sandhill was. Smart little bear. 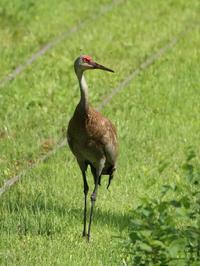 But after the black bear yearling headed off back in the woods...the male sandhill crane came walking back down to us. I love these gentle creatures. It was our first sighting of one in the U.P. that started our journey in wildlife photography over fifteen years ago. Another visitor on Sunday along the tracks of the Tahquamenon Falls Riverboat Tours & the Famous Toonerville Trolley...was our Big Momma Beulah. She is one of the first black bears we saw from our research blind seven years ago. She had three yearlings at that time. We saw her again in 2012 with twins…but hadn't seen her again till last year. She is has a pretty heart shape face....and is one big girl. We are hoping she may have a cubbie or two. Our trail cam showed her earlier in the day going through...with a shadow behind her...possibly a cub??? Time will tell. 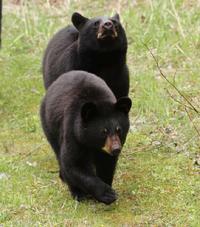 Once the male bears finally go off on their own...the young and mommas will be out on a regular basis. We can’t wait to get back…to see if we have cubs!! We headed back to our research blind along the tracks of the Toonerville Trolley. We were greeted by this beautiful bald eagle. We then had Momma Blaze come out to see us before we even got stopped. She has kicked her yearlings out and is now ready to mate. Speaking of which...the DB aka Dingle Beary...came out later. They started toward each other...then both disappeared to the east. It looks like we will cubbies next spring. We did see two of the yearlings but they didn't come down to see us. We also saw a coyote...no pics. Then a weasel came out with its dinner...pics tomorrow...and a male wolf...pics tomorrow. It was an AWESOME day along the tracks of the Toonerville Trolley!!! And the weather was perfect...hardly any bugs either. Before we could even get to the blind Momma Blaze started to head our way. She has already kicked the yearlings out. They will now have to fend for themselves. She is ready to breed with the D.B. aka Dingle Beary...and in order to have cubbies this winter. It's her time to eat all she can to guarantee survival for her new cubs and herself. After Blaze had her fill of treats...she headed down toward the D.B. He started heading toward her. It was so 'romantic'...LOL. Before they reached each other they both slipped into the woods...to rendezvous in private. FYI we did see two of the yearlings...they are fine...and will do well even without their momma. They will stay in the area with her...just not directly with her. After the black bears disappeared...we still had some visitors. First was this little weasel...with its very large lunch....aka a vole. It was quite comical to watch this very small predator trying to take its prey back to its family. Next we had several turkey vultures circle overhead to see if we had brought them anything.ck to what I am assuming is its nest to feed its young. Then last but not least we had this male wolf head down the tracks from the north. He spotted the speeder though and dodged into the woods...but came back out just to the south of us continuing on his hunt. The weather was perfect...the bugs were minimal and the wildlife outstanding!!! We headed back to our research blind around 1:00pm. It was cold and windy. We weren’t sure if we would see anything in this weather. Bears like to use their senses of smell and hearing to warn them of danger. We were there almost an hour with only the blue jays and red squirrels to keep us company. Then there they came…out from #2 on to the tracks. The yearlings were going back and forth…fighting with each other. We were so happy to see them all safe and sound after their winter hibernation. Momma Blaze and her triplets came wandering down the tracks to see us. With the cold north winds howling down the tracks…we weren’t sure we would see them. It was so wonderful to see them all looking so healthy after their long winter. Usually the yearlings look quite gawking and gangly...but these guys are still adorable. So after I left the Refuge at 9:00am...I head back to get Michael...and off to the tracks of the Toonerville Trolley to put up our research blind. We hadn't been there a half an hour when Mr. Dingle Berry came out to say 'hi'...well he actually just ate the treats we left for him down at #2...so he wouldn't come down and bother us. Despite the cold rainy weather that was predicted for this weekend...Michael and I decided there's no place like the U.P. to de-stress...no matter what the weather. We had hoped to get the black bear research blind up along the Toonerville Trolley...but the weather just didn't allow. Dixie Stewart, the owner, went with us to check on the bears. We didn't see them...but we were greeted by a pair of sandhill cranes...northern harriers...turkey vulture...sharp-tailed grouse and serenaded by the drumming of a male ruffed grouse. Not a bad way to spend a cold wet windy day. We were able to put the trail cam up...so we will see who came out to visit after we left.